Fly Casino now has Wild Beats slot! This is a new 25-line game that is filled with bright neon colors and techno dance beats. 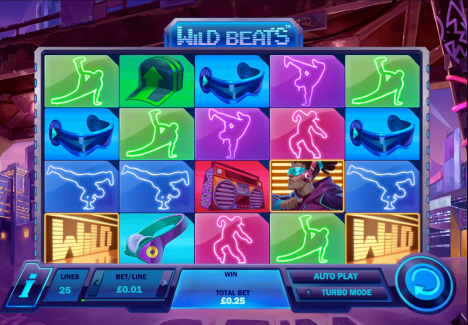 The main game symbols are a clever mix of hip-hop battle dancers displayed in bright pink, blue and purple colors along with wilds, stereos, trainers and headphones all in neon. Everyone loves bonus features and with this new slot game at Fly Casino, it’s all about the Dance It Out bonus feature! This feature is triggered when two special wild symbols appear anywhere on reels 2 and 4. When this happens, the game will transform lower value symbols into extra wilds on reel 3! Try it this weekend and dance your way to sky high winnings! 115% Bonus up to 115.00! On Sunday from 00:00GMT until 23:59 GMT, all members will receive a 115% bonus up to 150.00 on your deposits of $/£/€30 or more. Super $200’s. From 00:00GMT until 23:59 GMT, all members on their deposit of just $/£/€30 or more will receive a 100% bonus up to $/£/€200.00. Double 166% Big Money Tuesday! From 00:00GMT until 23:59 GMT, all members are invited to receive a 166% bonus up to $/£/€166.00 on your deposit of just $/£/€30 or more or more.